El Machete 2006 has the latest update regarding the stolen election in Mexico, including details on the rally and segments translated from Obrador’s speech. Ayman al Zawahiri today made a change in both policies. He wants al Qaeda to pile on in Gaza and to defend Hizbullah in Lebanon. While western analysts are describing Hezbollah as merely an extension of Iran, and therefore "Shia interests," the people of Cairo and Amman, predominantly "Sunni cities" took to the streets carrying pictures of Hasan Nasrallah the Shia Arab leader, defying the "Sunni-Shia rift," described by Peretz. Most western observers have conveniently ignored widespread Sunni support for Hezbollah throughout the Arab and Muslim world. As usual, Israel is radicalizing the Muslim world. The US, too, will suffer. Trying to install PHP5 in DarwinPorts on MacOS X 10.3 (Panther) was so gruelling an experience that I thought I would document it here, for reference. A lot of it was made difficult by just the lack of information (such as where a particular package may be found). The port system failed while attempting to fetch some dependencies (cclient). Perhaps an update of DarwinPorts might solve that? Well, the update failed with complaints of missing X11 headers, to be found in the X11 SDK. The message was friendly enough to point out that the SDK was available as part of XCode. Unfortunately, it looks like I did not choose to install the SDK when I installed XCode (btw XCode — 1.x — is available for Panther, contrary to some web pages, and can be downloaded from the Apple Developer Connection after you register and login — for free). To install the X11 SDK, what is needed is the X11SDK.pkg which unfortunately is not available for download, AFAICT, from the Apple download site (X11User.pkg is what you get when you download X11 from Apple). The X11 SDK, as intimated by DarwinPorts, is indeed available in XCode. Download XCode (1.5 in my case) and mount the dmg. You will find within, a directory named Packages which contains the sought after X11SDK.pkg. Install and enjoy! Update: I gave up on PHP5 but did manage to successfully install PHP4. Of course this is all co-existant (in the polls) with huge sympathy for Israel, and it probably looks like I am clutching at straws here. Marlin triumphs in fishing competition! HAMILTON, Bermuda (AP) — A fisherman was recovering from surgery after he was speared in the chest and knocked into the Atlantic Ocean by a blue marlin during a fishing competition off Bermuda's coast. "Anti-globalization" is a propaganda term devised by the advocates of a particular investor-rights version of international integration. No sane person is opposed to globalization, surely not the left or the workers movements, which were founded on the commitment to international solidarity — that is, a form of globalization that is concerned with the rights and needs of people, not private capital. TAP: Vol 13, Iss. 1. How to Judge Globalism. Amartya Sen. Globalization is often seen as global Westernization. On this point, there is substantial agreement among many proponents and opponents. Those who take an upbeat view of globalization see it as a marvelous contribution of Western civilization to the world. There is a nicely stylized history in which the great developments happened in Europe: First came the Renaissance, then the Enlightenment and the Industrial Revolution, and these led to a massive increase in living standards in the West. And now the great achievements of the West are spreading to the world. In this view, globalization is not only good, it is also a gift from the West to the world. The champions of this reading of history tend to feel upset not just because this great benefaction is seen as a curse but also because it is undervalued and castigated by an ungrateful world. From the opposite perspective, Western dominance–sometimes seen as a continuation of Western imperialism–is the devil of the piece. In this view, contemporary capitalism, driven and led by greedy and grabby Western countries in Europe and North America, has established rules of trade and business relations that do not serve the interests of the poorer people in the world. The celebration of various non-Western identities–defined by religion (as in Islamic fundamentalism), region (as in the championing of Asian values), or culture (as in the glorification of Confucian ethics)–can add fuel to the fire of confrontation with the West. Jackson Pollock by Miltos Manetas lets you paint your own Pollock. This was fun to see, especially for a Pollock-hater like me, but then I realized, what an interesting play area for a child. Point your browser at the URL and let your child click away and make his own Pollock! Remember to use your mouse buttons too! 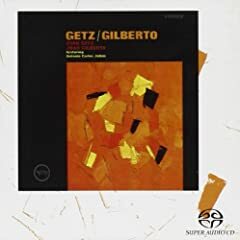 At the risk of stating the obvious, while simultaneously revealing my pop preferences, I have to ask: is there another album as good as Getz/Gilberto? Works for all occasions ranging from sitting back with your booze of choice, to working on churning out a few hundred lines of code.